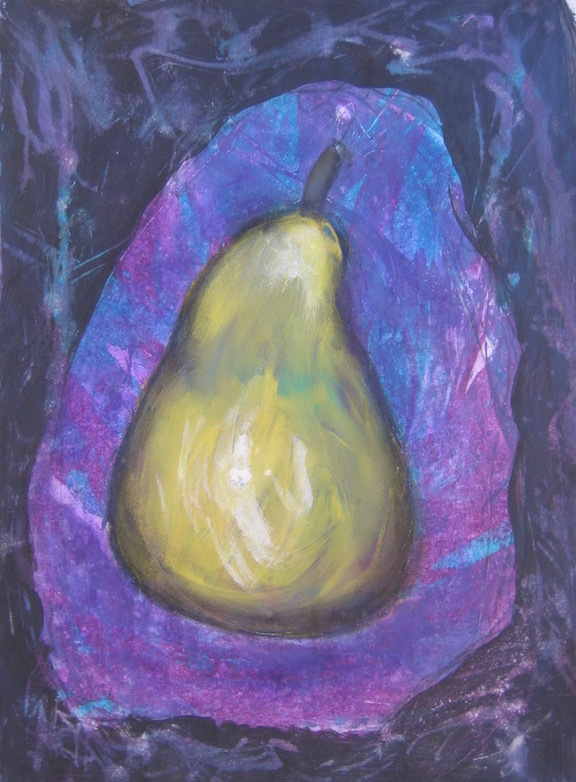 "First thoughts of this luscious, ripe pear is to be willing to eat of the sweet fruits of life. Also the garden of Eden, filled with trees of sumptuous fruit, offered for us. Then I think of my "Return to Eden" painting and that Heaven is spread upon the Earth, but we don't see it. There is some kind of inner permission happening, allowing me to enjoy life in a new way, without the underlayment of guilt that requires suffering as penance. Seeing through the dark sludge of my unconscious mind reveals a world that does not abide by popular opinion. Gravity is suspended. Eat the pear dear child, o’ suffering one. It is given to you by Spirit. You will not be banished again. That was your idea anyway. It was never a sin that you were expected to bear by anyone but you. Delight in a new day. Spirit calls you to remember who you are. Listen to the voice of Spirit in the birds and the wind in the trees. Your art is Calling you Home, right here & now. NowHere to go......"